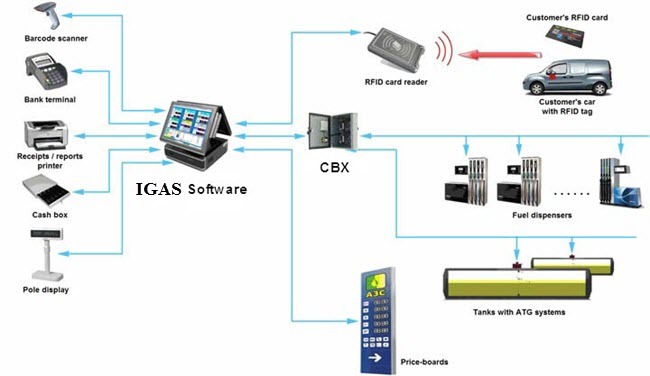 IGAS software for petrol stations! Area of application – petrol stations for dispensing of petroleum products, diesel fuel, liquified petroleum gas (LPG), compressed natural gas (CNG), multiproduct fuel petrol stations, petroleum storage depots. IGAS software can simultaneously control up to 32 fuel dispenser sides (fueling places). Connection of fuel dispensers and ATG systems is made through a CBX controller, which supports more than 60 types of of fuel dispensers of various manufacturers (Wayne Dresser Europe, Wayne Dresser Brasil, Gilbarco Veeder Root, Tokheim, Nuovo Pignone, Wayne Pignone, Tatsuno Japan, Tatsuno Europe, Tatsuno Rus, Tokico, Bennett, Petrotec, Salzkotten, FAS, Adast, MM Petro ZAP, Emgaz Dragon, Galileo, Kraus, Welma, PEC (Gallagher), Develco, Logitron, Kalvacha, Safe, Wayne Meksan, Mekser, Mepsan, 2A, Petposan, Petrolmeccanica, Batchen, Email, EuroPump, Baransay, Sanki, Korea EnE, LG EnE, SOMO Petro, HongYang, Blue Sky, GreenField, Falcon, Dong Hwa Prime, EPCO, Slavutich, Shelf, UniCon, UniGaz and others.) and also various types of automatic tank gauge (ATG) systems of various manufactures (ASSYTECH, EBW, ENRAF, FAFNIR, FRANKLIN FUELING, GILBARCO Veeder Root (TLS-2, TLS-300, TLS-350, TLS-450), HECTRONIC, INCON, LABKO, MTS ATG SENSORS, OMNTEC, OPW, PETRO VEND, START ITALIANA, STRUNA, UNIPROBE, VEGA, WINDBELL and others). Visualization and supervision of petrol station activity real-time (locally and remotely) - IGAS software provides a easy possibility to monitor all the forecourt equipment operation online and inform about all malfunctions and events. Supports over 70 communication protocols of fuel dispensers and ATG systems. 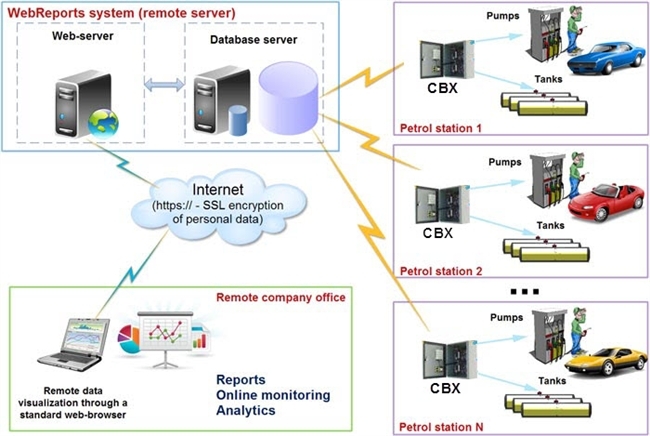 Application of CBX controller over fuel dispensers and ATG systems gives a possibility to easily connect to any of the supported fuel dispensers. Rich set of interface converters for connection to fuel dispensers provides compatibility with various kinds of input interfaces. Scalability - IGAS system is developed with taking into account all the modern requirements to systems for automation of petrol stations. It is as relevant to small petrol stations, as it is to big petrol complexes with organization of several working places of cashiers, administrator (Back-Office) of a petrol station, central Head-Office for management and planning and provision of loyalty card system for customers. 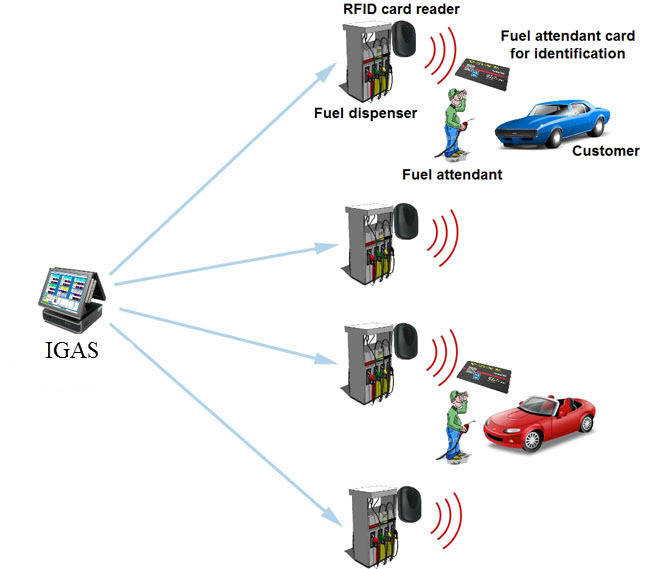 Possibility to provide control over same fuel dispensers from several IGAS systems - Several IGAS systems can be installed on the same petrol station and share common equipment and database. Easy updating - IGAS is easy to be updated, when updates are installed, all of system database, software and hardware adjustments are kept. All new updates are available for download to all existing customers. Easy way to back up and restore IGAS controller configuration between updates. Support by developers - 24 hour support to all customers of IGAS software on any standing issues. IGAS system provides a convenient user interface, which can be adjusted to fit your needs and preferences. Windows of pumps, products sales, tanks can be dragged to any place on the main panel and fixed, their scale can be changed and colors can be adjusted. IGAS software is designed to make it possible to flexibly configure and adjust a required way of operation and allow customers to make it work as their local rules demand. One of the commonly used methods of IGAS operation is when control over fuel dispensers is made by fuel attendants, who service customers. Fuel attendants operate dispensers and receive payment from customers. Fuel attendants control the fuel dispensers as if those worked in a standalone mode (administering starts automatically when the dispensing nozzle is lifted and trigger is pressed). In this mode it is possible to make fuel order preset (in volume or in money amount) from the dispenser preset keyboard. At this momentIGAS software monitors all the transactions being performed and writes all the information to its database. Also cashier at any time can see activity of every fuel dispenser and in case of necessity can stop any of them and receive reports on operation remotely from IGAS software. Receipts can be optionally printed after each dispensing. IGASCards fuel cards system for petrol stations – hardware and software complex, appointed for provision and account of fuel sales at petrol station networks using fuel cards with fuel volume, money and discount wallets or their mixtures. The system allows to replace usage of cash and coupons to more reliable and convenient settlements using fuel and money cards. 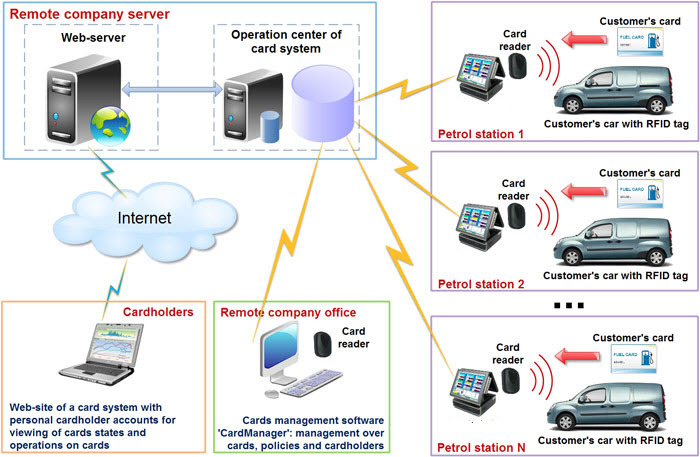 Card of the IGASCards system can be used for filling with petrol at petrol station and reception of a discount.